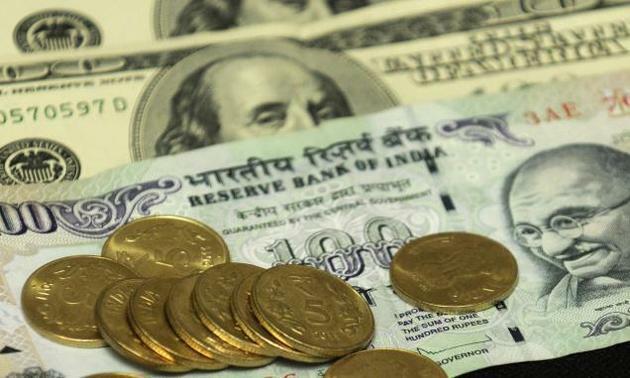 MUMBAI: The rupee depreciated 14 paise to 70.94 against the US dollar in opening trade at the interbank forex market on Thursday on increased demand for the greenback from importers and banks amid rising global crude prices. A strong dollar in overseas markets and a lower opening of the domestic equity market weighed on the rupee, a currency dealer said. Brent crude, the international benchmark was trading higher by 0.46 per cent at USD 63.90 per barrel Thursday. The rupee opened weak at 70.91 and fell further to 71.05, but recovered partially to trade at 70.94, still down by 14 paise against the dollar. On Wednesday, the rupee had ended 10 paise lower at 70.80 against the US dollar on rising global crude prices and heavy foreign fund outflows. On a net basis, foreign investors withdrew Rs 676.63 crore from stocks on Wednesday, according to provisional FPI data. Meanwhile, the benchmark BSE Sensex shed 60.05 points, or 0.17 per cent, to 35,974.06 in early trade Thursday.